Washington, March 21: The Pentagon's inspector general has formally opened an investigation into a watchdog group's allegations that acting Defense Secretary Patrick Shanahan has used his office to promote his former employer, Boeing Co. Citizens for Responsibility and Ethics in Washington filed an ethics complaint with the Pentagon's inspector general a week ago, alleging that Shanahan has appeared to make statements promoting Boeing and disparaging competitors, such as Lockheed Martin. Shanahan, who was travelling with President Donald Trump to Ohio on Wednesday, spent more than 30 years at Boeing, leading programs for commercial planes and missile defense systems. 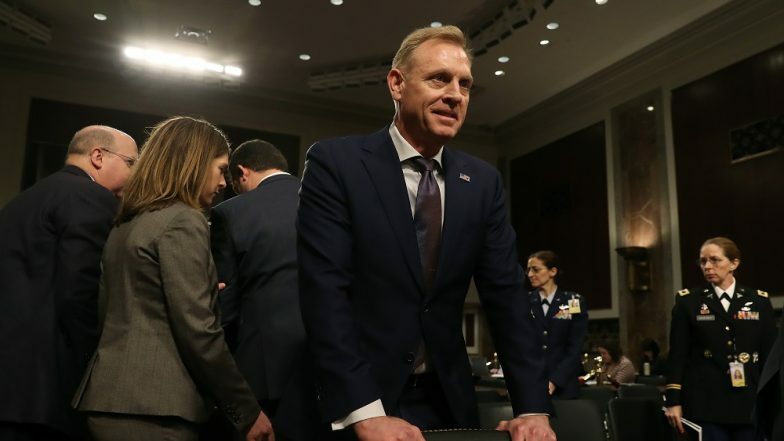 He has been serving as acting Pentagon chief since the beginning of the year, after James Mattis stepped down. Ethiopian Airline Crash Fallout: DGCA Seeks Details of Boeing-737 MAX From Jet Airways & SpiceJet. The probe comes as Boeing struggles to deal with a public firestorm over two deadly crashes of the Boeing 737 Max 8 jetliner within the last five months. And it focuses attention on whether Trump will nominate Shanahan as his formal pick for defense chief, rather than letting him languish as an acting leader of a major federal agency. Dwrena Allen, spokeswoman for the inspector general, said Shanahan has been informed of the investigation. And, in a statement, Pentagon spokesman Tom Crosson said Shanahan welcomes the review. Boeing 737-MAX Aircraft Grounded By DGCA, Days After Ethiopian Airlines Crash. "Acting Secretary Shanahan has at all times remained committed to upholding his ethics agreement filed with the DoD," said Crosson. "This agreement ensures any matters pertaining to Boeing are handled by appropriate officials within the Pentagon to eliminate any perceived or actual conflict of interest issue(s) with Boeing." During a Senate hearing last week, Shanahan was asked by U.S. Sen. Richard Blumenthal, D-Conn., about the 737 Max issue. Shanahan said he had not spoken to anyone in the administration about it and had not been briefed on it. Asked whether he favored an investigation into the matter, Shanahan said it was for regulators to investigate. On Wednesday, Blumenthal said that scrutiny of Shanahan's Boeing ties is necessary. "In fact, it's overdue. Boeing is a behemoth 800-pound gorilla - raising possible questions of undue influence at DOD, FAA and elsewhere," said Blumenthal. Shanahan signed an ethics agreement in June 2017, when he was being nominated for the job of deputy defense secretary, a job he held during Mattis' tenure. It outlined the steps he would take to avoid "any actual or apparent conflict of interest," and said he would not participate in any matter involving Boeing. One example raised by the complaint is the Pentagon's decision to request funding for Boeing 15EX fighter jets in the 2020 proposed budget. The Pentagon is requesting about USD 1 billion to buy eight of the aircraft. Shanahan, 56, joined Boeing in 1986, rose through its ranks and is credited with rescuing a troubled Dreamliner 787 program. He also led the company's missile defense and military helicopter programs. This is only the third time in history that the Pentagon has been led by an acting chief, and Shanahan has served in that capacity for longer than any of the others. Presidents typically take pains to ensure the Pentagon is being run by a Senate-confirmed official, given the grave responsibilities that include sending young Americans into battle, ensuring the military is ready for extreme emergencies like nuclear war and managing overseas alliances that are central to US security.